Indiana Jones would have been proud… sort of! 15 Rotarians and guests set out for a hiking adventure on Saturday morning, December 3, at the UW Arboretum. High spirited and bundled up for the looming winter weather, we set out to find Madison’s ‘Lost City’ and enjoy the woods, prairies and savannas along the way. The Arboretum is amazing this time of the year. While the lilac grove definitely is brighter in bloom, it makes for an interesting backdrop against the changing landscape ready for another Madison season. Along the way we encountered 25 turkeys. One of which was easily large enough to be ridden by Ellie Schatz or worthy of a Presidential pardon before Thanksgiving. Now, back to that ‘Lost City’. While we gave it our best attempt, it will remain lost to this group … for now. Another attempt will be made in the spring. So join us on the next Rotary hiking adventure. 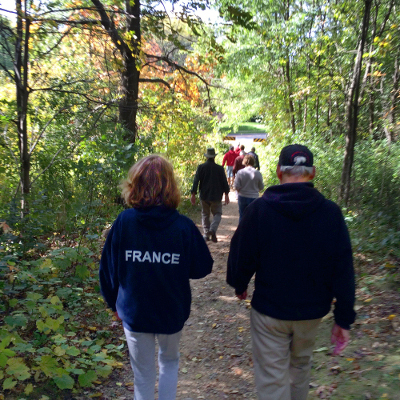 Many things brought a group of 10 Rotarians and guests to the Aldo Leopold Nature Center on Saturday, October 22. Did you know Debbie Gilpin is on the Nature Center’s board? Frank Stein quipped that only one tree grows in Brooklyn, where he grew up, and therefore he loves being among the trees in Wisconsin. Herman Baumann grew up not far from Brooklyn in New Jersey, and he became an outdoorsman and conservation writer after he moved here. 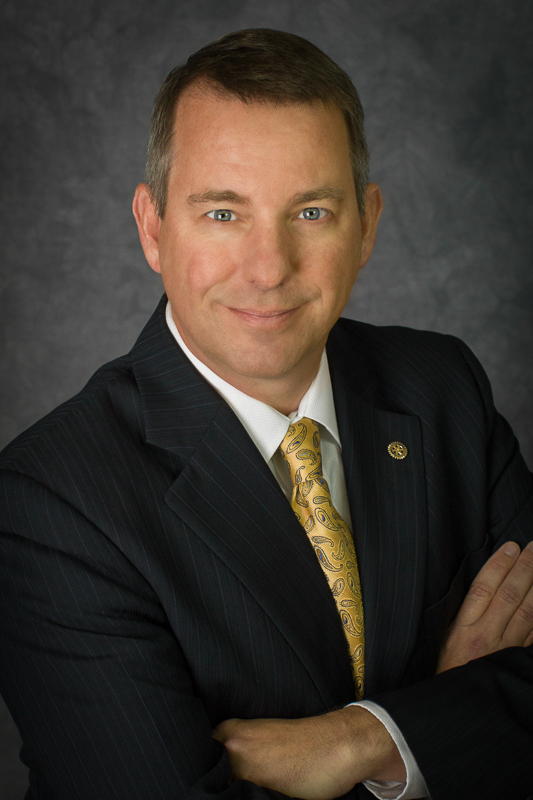 Jeff Tews served on the Rotary Community Grants Committee when it made a grant to support the Center’s Campfire Fund, making it possible for 5 out of 14 economically-challenged children to attend summer camps at the Center this year. The rest of us simply were inspired by the opportunity to take a walk in this natural gem in an urban area on a beautiful fall day. Karl Gutknecht organized the outing and arranged for a guided tour of the property by Kelley Van Egeren, Director of Development and Stewardship. Kelley claimed to have the best job in the world, and she’s had it for 15 years. She loves the Center’s mission to connect kids, and all visitors, to nature. 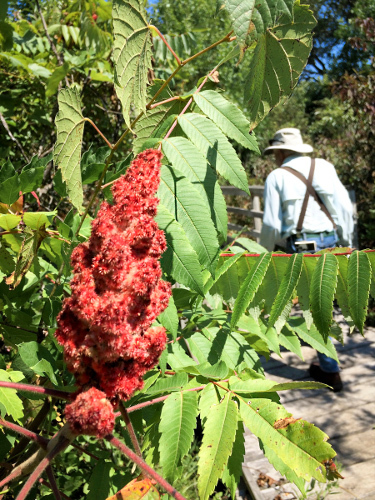 Aldo Leopold Nature Center offers 21 acres of oak savanna, wetlands, prairies and woodlands, and it serves more than 20,000 kids per year. On our walk we encountered a group of Eagle Scouts engaged in a work project. They had obtained donated materials and were working to seat and build new workbenches near the pond. Several Brownies were busy identifying pond critters at a similar workbench nearby. We finished our tour at a replica of Aldo Leopold’s home. Kelley explained that Leopold and his wife used a suspended, old-fashioned snow fence – the kind with wooden slats – as a bed for their five children. I wish I’d known about that 35 years ago. We could have saved a bundle on bedding for our kids! Hiking Fellowship Downtown Rotarians and guests (front kneeling from left) Jeff Tews, Karl Gutknecht, and Deb Gilpin. (Standing from left) Kelley Van Egeren, Aldo Leopold Nature Center; Leslie Overton, Dean Nelson, Herman Baumann, Susan Rather, Andrea Kaminski, Kay Schwichtenberg, and Frank Stein. 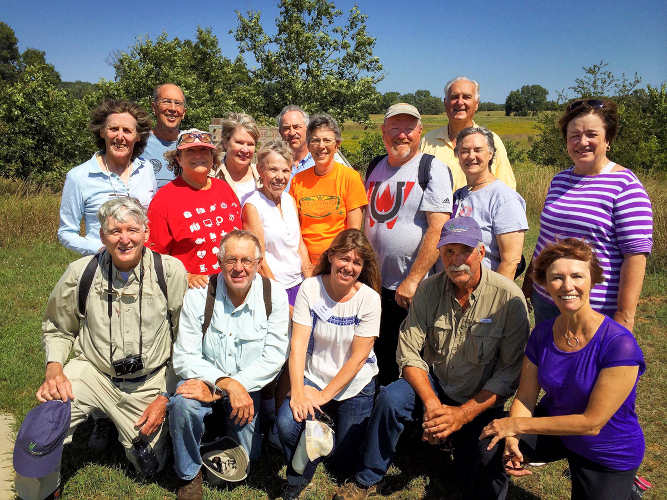 Rotary Club of Madison’s Hiking Fellowship was hosted on October 10 by Rotarian Bob Graebner and his wife Linda, at their home in Madison’s Parkwood Hills neighborhood. The hike was a spectacular walk through their leafy neighborhood and into Owen Conservation Park. 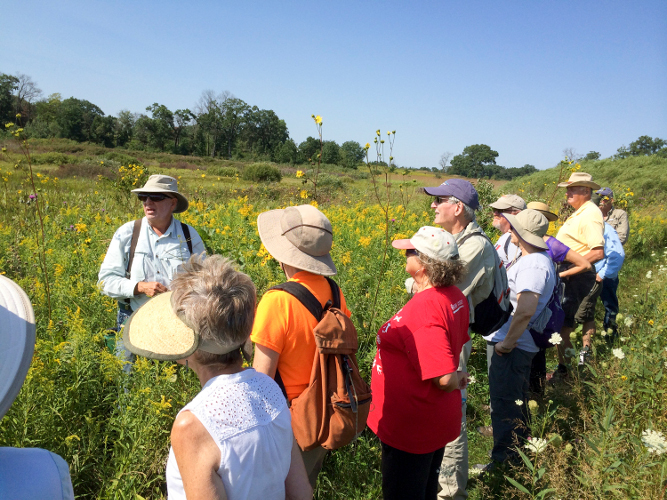 The 92 acre Owen Conservation Park includes a 40-acre woodland, a 15-acre restored prairie, and a 37-acre meadow, as well as 3 stormwater/wildlife ponds that were added in 2008 to reduce the sediment that flowed into Lake Mendota from area mall parking lots. 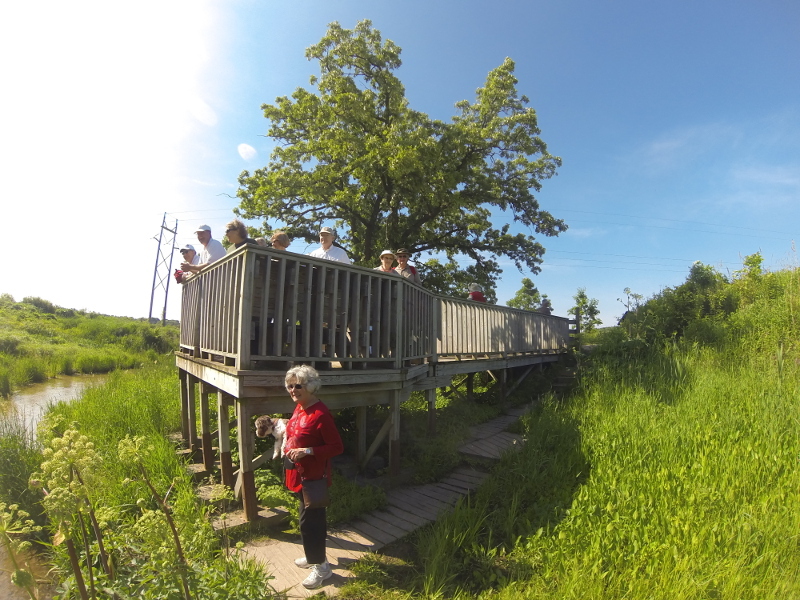 Bob described having seen cranes, herons and other waterfowl at the ponds. He led us up hills and down dales through prairies and woodlands which were beginning to show fall color. Charlotte De Monceau, our Rotary Youth Exchange student from Lyon, France, joined the group and shared her experiences thus far in Madison. 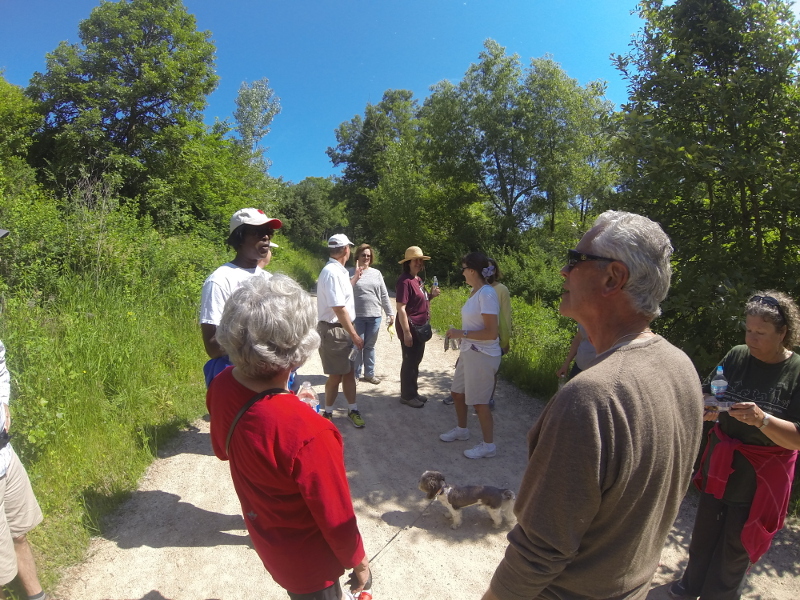 Multiple conversational groups formed and reformed during the 3.4 to 4.2 mile hike. (Mileage reported by various cell phone apps.) 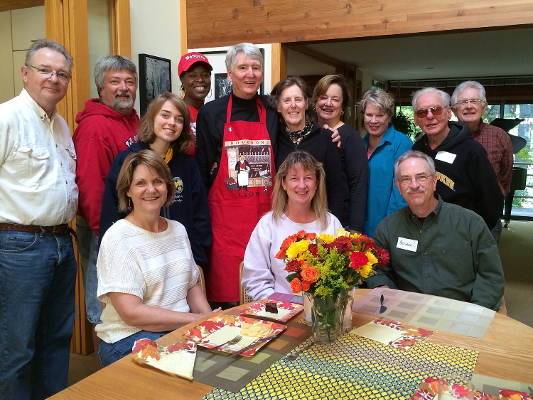 The hikers enjoyed a delicious luncheon prepared by Linda Graebner. The cheeses and French bread added a touch of Francais to the meal, and the large windows and leafy views made it feel like a pique-nique! 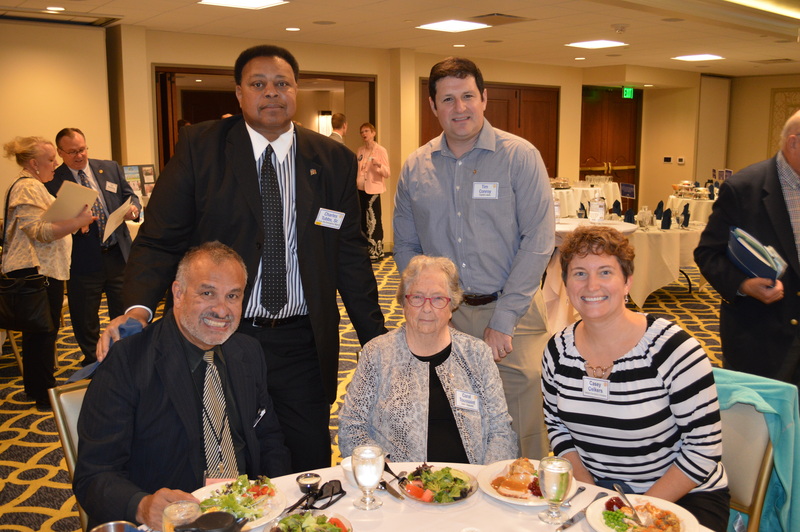 All in all, it was a gorgeous fall day shared by companionable Rotarians. 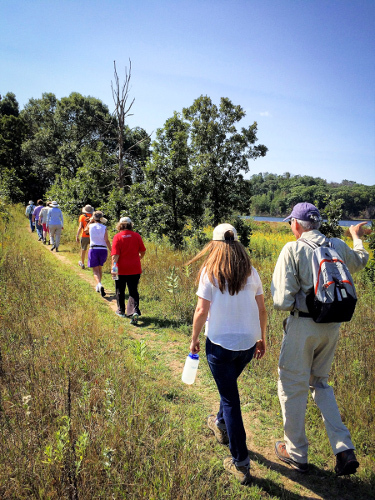 Downtown Rotarians and guests were hosted by The Wisconsin Friends of John Muir and Natural Heritage Land Trust while hiking Muir’s boyhood farm home terrain in Marquette County Saturday. They learned that Muir’s conservation ethic was formed as a young man on the Muir Wisconsin homestead. These boyhood years in Wisconsin inspired his conservation ethic and love and appreciation of the natural world. Muir went on to espouse an intrinsic, spiritual value and beauty in nature and maintained that all living things are interconnected. 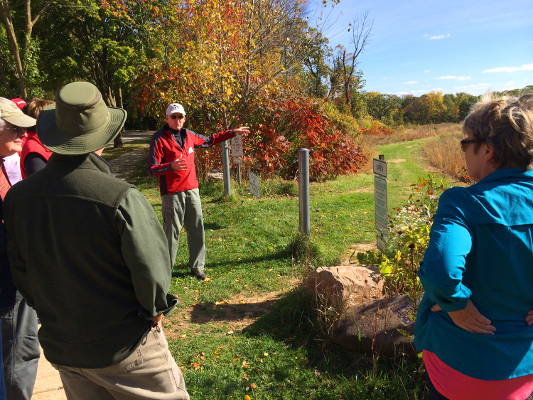 Providing interpretations on the John Muir Memorial Park and nearby Observatory Hill hikes were Wisconsin Friends of John Muir Board of Directors Mark Martin and Fred Wollenburg as well as Heidi Habeger, Natural Heritage Land Trust. 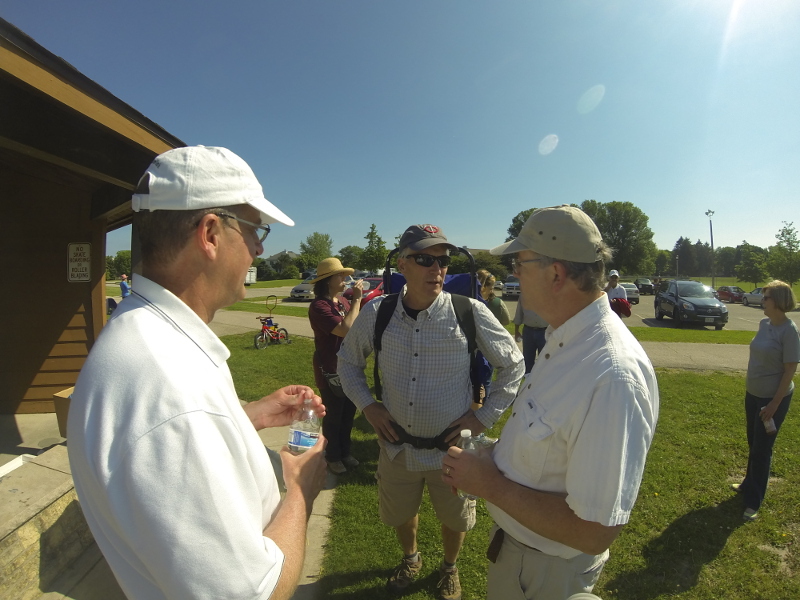 Hiking/Skiing Fellowship Group chair, Bob Graebner, was hike coordinator. The John Muir Memorial Park and Friends of John Muir celebrate the legacy of this great naturalist, a founder of The Sierra Club and often called the father of our country’s National Park System. The Natural Heritage Land Trust seeks to permanently protect local natural areas, rivers and streams, wildlife habitat, and working farms. It recently purchased part of the original John Muir family farm, bringing the total protected landscape to 1,400 acres, which includes the Muir Park and Fox River National Wildlife Refuge. Further information on the John Muir Memorial Park can be found at Wisconsin Friends of John Muir, website www.johnmuir.org/wisconsin and for the Natural Heritage Land Trust, www.nhlt.org.